Clearly I’m not paying much attention to my blog while I’m visiting my family for the holidays – I did get my life Black-bellied Whistling Ducks over the weekend, though, and I’m sure I’ll have more to share after the Christmas Bird Count I’m doing on the 26th. 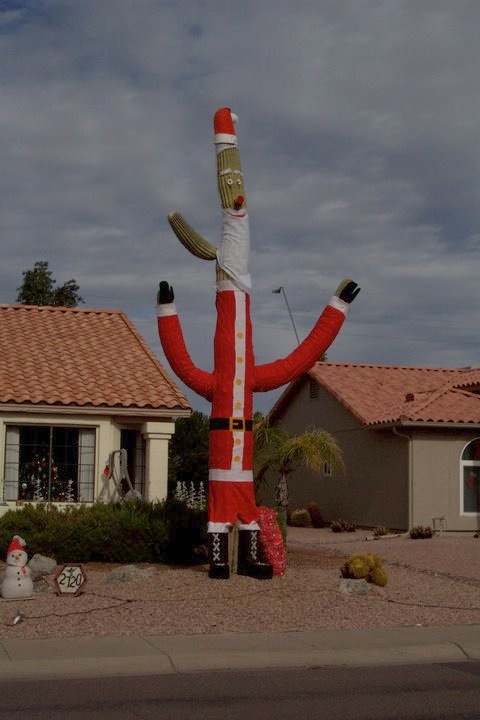 In the meantime, Saguaro Santa, a holiday fixture in my parents’ neighborhood, says Merry Christmas. That is hilarious! And what a feat too, I’d be terrified to get on top of my ladder to dress up a cactus! Thanks for sharing. Although you can’t see it in the photo, there’s also a second, smaller saquaro with a reindeer face on it! Excellent- my kids think that is hilarious. I’ve heard they use a crane or a mighty lift to finish the top. Last year they got the suit on and then it stayed headless for several days because the cactus had grown and they had to lengthen the beard. Too funny! Even with a crane, you really have to be in the holiday spirit to dress a cactus! That is one of the scariest things I’ve ever seen. Saguaro Santa will haunt my dreams.